A power supply is required to operate any Wilson amplifier. Power supply, also called power adapters, provides the external power needed to power the signal boosting system. There are different types of power supplies available and each amplifier may have a specific power requirements and jack compatibility. When shopping for a spare or replacement power supply, ensure that you get the correct one for your amplifier unit or kit. The following building and vehicle power supplies specify what Wilson amplifier product they go with. For vehicle applications, there are two options available, the standard DC cigarette lighter adapter which plugs directly into the cigarette lighter socket and the hardwire assembly which connects directly to a power source within the vehicle. This could include the steering column, a fuse box or directly to the battery. This method is usually done by audio and alarm professionals or electricians. 5V Mini-USB DC Power Supply (859963) is a cigarette lighter adapter for all Sleek cradle amplifiers, MobilePro, and the Data Pro. It includes a 3ft cable with Mini-USB connector. Compatible amplifiers include Sleek 4G (813425, 813426, 813426-H), Sleek 4G-V (815125, 815126, 815126-H), Sleek 4G-A (815325, 815326, 815326-H), Sleek 4G-C (812726F, 812726F-H), Sleek (815225, 815226, 815226-H), MobilePro(801240, 801241, 801242), and Data Pro (811225, 811226). 6V DC Power Supply (859913) is for the Mobile Wireless amplifier. This power supply is designed to plug directly into the cigarette lighter port within the majority of vehicles. Compatible vehicle kits include the 801201 and 801212. The 10ft cable has the standard 2.5x 5.5mm DC jack. 12V DC Power Supply (859983) works with Direct Connect and SignalBoost amplifiers. It plugs directly into the cigarette lighter port within the majority of vehicles. Compatible amplifiers include the 811210, 811211, 811214, 811215, 811710, 811910, 811101, 811201 and 812201. The 9ft cable includes the standard 2.5x 5.5mm DC jack. 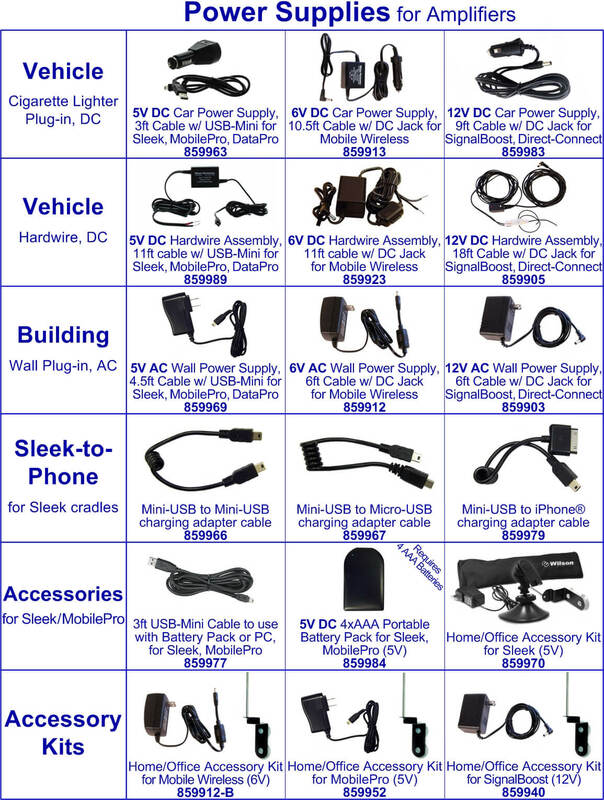 5V Mini-USB DC Hardwire Power Supply Kit (859989) is the hardwire option for the 859963 cigarette lighter adapter. It works with Sleek cradle amplifiers, the MobilePro and the Data Pro. It gives the option to permanently mount the Mini-USB cable to a vehicle and has an 11ft cable. Compatible amplifiers include Sleek 4G (813425, 813426, 813426-H), Sleek 4G-V (815125, 815126, 815126-H), Sleek 4G-A (815325, 815326, 815326-H), Sleek 4G-C (812726F, 812726F-H), Sleek (815225, 815226, 815226-H), MobilePro(801240, 801241, 801242), and Data Pro (811225, 811226). 6V DC Hardwire Power Supply Kit (859923) is the hardwire option to the 859913. It is compatible with Mobile Wireless amplifiers (801201, 801212). This power adapter includes the standard 2.5x 5.5mm DC jack, an 11ft cable, and has a built-in 2 amp fuse. 12V DC Hardwire Power Supply Kit (859905) is similar to the 859983 only it is the hardwire option. It can also work with Direct Connect and SignalBoost amplifiers. This 18ft cable has the standard 2.5x 5.5mm DC jack. It also includes Velcro adhesive straps for securing the cable to upholstery. For building applications, there are AC power adapters for a standard American wall socket. However, all of these adapters are 100-240V meaning they are capable of working for any wall socket with the proper adapter. 5V Mini-USB AC Power Supply (859969) is for Sleek cradle boosters, the MobilePro and the Data Pro. The 4ft cable includes the standard 2.5x 5.5mm DC jack. Compatible amplifiers include Sleek 4G (813425, 813426, 813426-H), Sleek 4G-V (815125, 815126, 815126-H), Sleek 4G-A (815325, 815326, 815326-H), Sleek 4G-C (812726F, 812726F-H), Sleek (815225, 815226, 815226-H), MobilePro(801240, 801241, 801242), and Data Pro (811225, 811226). 6V AC Power Supply (859912) works most building amplifiers including AG Pro, AG Pro Installer, AG SOHO 65, AG SOHO 60, DB Pro, DT Desktop. The 6ft cable includes the standard 2.5x 5.5mm DC jack. Compatible amplifiers includes the 801105, 801106, 801108, 801110, 801201, 801213, 801215, 801306, 801506, 801606, 804005, 804006, 801247, 801230, 801232, 801245, 801245-B, 801245-T, 801262, 801265, 801265-BL, 801280, 801280-BL1, 801280-BL2, 801365, 801865, 802365, 805045, 841245, 841262, 841263, 841365, and 844006. 12V AC power supply (859903) works with SignalBoost and Direct Connect amplifiers. Specifically it can work with the 811210, 811211, 811214, 811215, 811710, 811910, 811101, 811201 and 812201. The 6ft cable includes a standard 2.5x 5.5mm DC jack. Sleek-to-Phone Power Supplies connect your phone directly to the Sleek cradles’ Mini-USB port to simultaneously charge and boost your phone. These include a Mini-USB to Mini-USB charging adapter cable (859966) for phones which utilize a Mini-USB jack, a Mini-USB to Micro-USB charging adapter cable (859967) for phones which utilize a Micro-USB jack and a Mini-USB to iPhone charging adapter cable (859979) which is compatible with the original iPhone, iPhone 3G, iPhone 3GS, iPhone 4 and iPhone 4S. 5V USB Portable Power Supply (859984) is a power supply which charges a device using four AAA batteries. This device requires the 859977 Mini-USB cable to connect to a device. Devices which it can work with include cradle boosters such as the Sleek family, the MobilePro, and the Data Pro. It provides up to 6 hrs of standby and 2 hrs of talk time. Compatible amplifiers include Sleek 4G (813425, 813426, 813426-H), Sleek 4G-V (815125, 815126, 815126-H), Sleek 4G-A (815325, 815326, 815326-H), Sleek 4G-C (812726F, 812726F-H), Sleek (815225, 815226, 815226-H), MobilePro(801240, 801241, 801242), and Data Pro (811225, 811226). Mini-USB to USB Cable (859977) is 3ft long and allows for charging an amplifier using a USB-A charging port. Compatible amplifiers includes Sleek 4G (813425, 813426, 813426-H), Sleek 4G-V (815125, 815126, 815126-H), Sleek 4G-A (815325, 815326, 815326-H), Sleek 4G-C (812726F, 812726F-H), Sleek (815225, 815226, 815226-H), MobilePro(801240, 801241, 801242), and Data Pro (811225, 811226). There are also amplifier-specific Home/Office accessory kits, including amplifier-specific power supplies are designed for home/office applications of vehicle. This allows for a vehicle amplifier to be moved between vehicle, home, office, or hotel room making it truly portable. Sleek/MobilePro Home Accessory Kit (859970) is a Home Accessory Kit for any cradle booster or MobilePro. This kit includes the 859969 Mini-USB AC power supply, the 901128 suction cup outside antenna window mount with long radial (to prevent interference between the outside antenna and inside antenna), 901137 adjustable desktop mount and 859946 13 inch zippered carrying case. MobilePro Home Accessory Kit (859952) is similar to the one above only it does not include the 13 inch zippered carrying case or the desktop mount. Since the MobilePro does include a Home Accessory Kit, this is basically a replacement part. Mobile Wireless Home Accessory Kit (859912-H) includes the 8599126V AC power supply and a bracket for a magnet mount exterior antenna which mounts onto a window using suction cups (901128). The window bracket includes a radial to ensure that there is no interference between the exterior and interior antennas. This kit is designed to allow for the 801201, 801212, 801201-T and 801201-B to be used in a building setting. SignalBoost Home Accessory Kit (859940) is a Home Accessory Kit for the 811211 as well as the majority of Direct Connect or wired vehicle solutions. The kit includes the 859903 12V AC power supply and a window bracket for the exterior antenna which uses suction cups to mount onto a window. The window bracket also includes a long radial to prevent interference between interior and exterior antennas in the case that the user wants to use the SignalBoost with a wireless interior antenna.